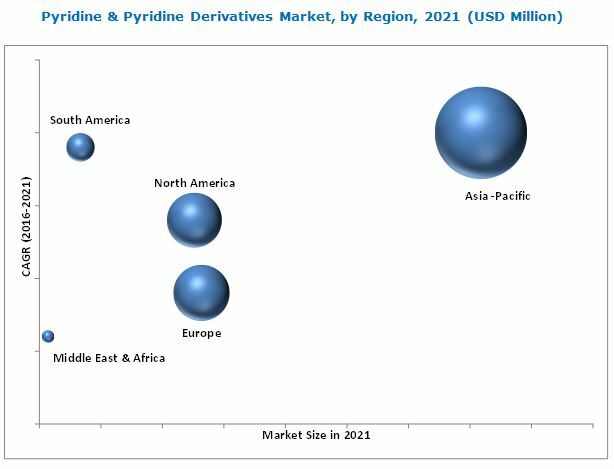 [166 Pages Report] Pyridine & Pyridine Derivatives Market was valued USD 453.2 Million in 2015, and is projected to reach USD 656.3 Million by 2021, at a CAGR of 6.6%, from 2016 to 2021. The base year considered for the study is 2015, while the forecast period is from 2016 to 2021. 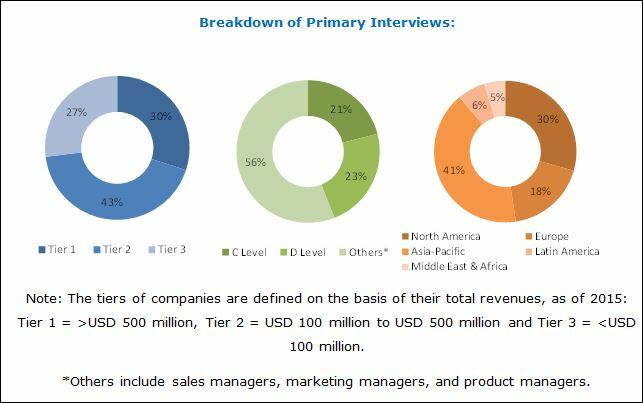 Both, top-down and bottom-up approaches have been used to estimate and validate the size of the pyridine & pyridine derivatives market and to estimate the sizes of various other dependent submarkets in the overall market. The research study involved the extensive use of secondary sources, directories, and databases such as Hoovers, Bloomberg, Chemical Weekly, Factiva, and other government and private websites to identify and collect information useful for the technical, market-oriented, and commercial study of the pyridine & pyridine derivatives market. Some of the major players in the pyridine & pyridine derivatives market include Jubilant Life Sciences Ltd. (India), Vertellus Holdings LLC (U.S.), Lonza Group AG (Switzerland), Nanjing Redsun Co. Ltd. (China), Resonance Specialties Ltd. (India), Shandong Luba Chemical Co. Ltd. (China), Hubei Sanonda Co. Ltd. (China), Chang Chun Petrochemical Co. Ltd. (Taiwan), Koei Chemical Co. Ltd. (Japan), and C-Chem Co., Ltd. (Japan). This research report categorizes the pyridine & pyridine derivatives market on the basis of type, application, and region. The market has been further analyzed for the key countries in each of these regions. The pyridine & pyridine derivatives market is projected to reach USD 656.3 Million by 2021, at a CAGR of 6.6% from 2016 to 2021. Pyridine is used in several applications such as agrochemicals, pharmaceuticals, latexes, food, and others. The increasing usage of pyridine in these applications is expected to drive the market for the pyridine & pyridine derivatives during the forecast period. Pyridine is segmented by types, namely, pyridine, beta picoline, alpha picoline, gamma picoline, and others. Pyridine type was the most widely used in the pyridine & pyridine derivatives market by volume, in the year 2015. Pyridine is used in different applications such as a solvent in the paint and rubber application, as a denaturant for alcohol, in antifreeze mixture, ethyl alcohol, and fungicides. Pyridine is used to manufacture vitamins, medicines, food flavorings, dyes, adhesives, pesticides, and herbicides. More than half of the pyridine produced is used to produce pesticides and herbicides. Rising use of pharmaceuticals has led to an increase in the demand for pyridine & pyridine derivatives globally. The Asia-Pacific is projected to be the largest market for pyridine & pyridine derivatives followed by Europe. India is expected to be the fastest-growing market for pyridine & pyridine derivatives during forecast period. Top producers of pyridine & pyridine derivatives such as Jubilant Life Sciences Ltd. (India), Resonance Specialties Ltd. (India), and Nanjing Redsun Co. Ltd. (China) are located in the Asia-Pacific. Pyridine is banned in 36 countries including China and use is restricted in some countries. It is listed in PAN International’s Dirty Dozen (1985) and in Highly Hazardous Pesticides (2010). Also, many non-regulating organizations such as UTZ Coffee Certification, Rainforest Alliance, and Fairtrade Labelling Organization have prohibited the use of pyridine. This can act as a restraint to the growth of the market. Companies are investing in expansions and the manufacture of advanced products to cater to the increasing demand and strengthen their product portfolios in the pyridine & pyridine derivatives market. For example, Vertellus completed the expansion of its new niacinamide feed plant in Nantong, China. The new plant is Vertellus’ third production facility at the Nantong site. The expansion fully integrates the Nantong site from the production of beta picoline through the production of vitamin B3. Companies such as Jubilant Life Sciences Ltd. (India), Vertellus Holdings LLC (U.S.), Lonza Group AG (Switzerland), Nanjing Redsun Co. Ltd. (China), Resonance Specialties Ltd. (India), Shandong Luba Chemical Co. Ltd. (China), Hubei Sanonda Co. Ltd. (China), Chang Chun Petrochemical Co. Ltd. (Taiwan), Koei Chemical Co. Ltd. (Japan), and C-Chem Co., Ltd. (Japan) adopted the expansions, mergers & acquisitions, joint-ventures, agreements and new product developments strategies to expand their market shares and distribution networks in the pyridine & pyridine derivatives market from 2012 to 2016. 5.2.2.2 Government Regulations on Usage of Other Agrochemicals Related to Pyridine and Its Derivatives. 11.1 Jubilant Life Sciences Ltd.
11.4 Nanjing Redsun Co. Ltd.
11.6 Shangdong Luba Chemical Co. Ltd.
11.7 Hubei Sanonda Co. Ltd.
11.8 Chang Chun Petrochemical Co. Ltd.
11.9 Koei Chemical Co. Ltd.